Many people in the residential community do not know that their garage door system consists of hundreds of vital parts necessary to ensure a smooth operation. One of the most important components in that operation is the garage door spring. We offer outstanding service options on the garage door extension and garage door torsion spring in Baytown, Texas. Your garage door type and size will help determine which type of spring is best suited for your situation. Both types are used to properly balance the door during the opening and closing process. Whether you need garage door torsion spring repair or replacement service; our experts will do the job right. Why Choose Garage Door Repair Baytown? Whether you need repair, replacement or simple torsion spring adjustment; you cannot go wrong with our team of highly trained professionals. Our certified technicians have serviced a wide range of springs over the years. We have the experience and polished skills to administer dependable service in a short period of time. Our service trucks are properly stocked with quality extension and torsion springs to ensure the most efficient service possible. These are all great reasons to choose Garage Door Repair Baytown for trusted results. In the best case scenario, a simple adjustment can resolve the problem with your garage door springs. However, in many cases, you will need garage door torsion spring replacement service. This process should only be administered by a qualified specialist with a great deal of experience and training. These components are wound very tight to induce the tension needed to thoroughly balance heavy garage doors. If one of these units should snap back during service, it could lead to injury or death. 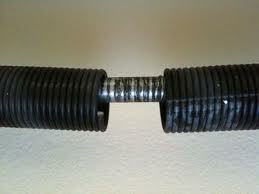 Baytown garage door torsion spring service should always be taken seriously. Extension springs are mounted on the sides of garage doors, while the torsion springs are mounted directly above. It is imperative that you choose someone you can trust to administer service on these items. Make Baytown Garage Door Repair you choice for quality service.